Ahold Delhaize is deploying as many as 500 robots in Giant and Stop & Shop supermarkets following a strategic venture between the holding company and Badger Technologies. 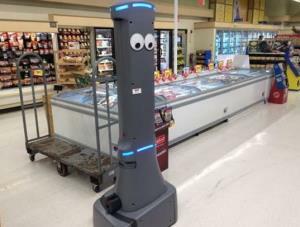 The 7-ft robot will roam stores and stop in areas with spills to prevent injury from slipping on liquids. Robots are equipped with scanners to prevent damage to shelving and displays and are guided by cameras.